GIFT SET - SARAH COVENTRY. 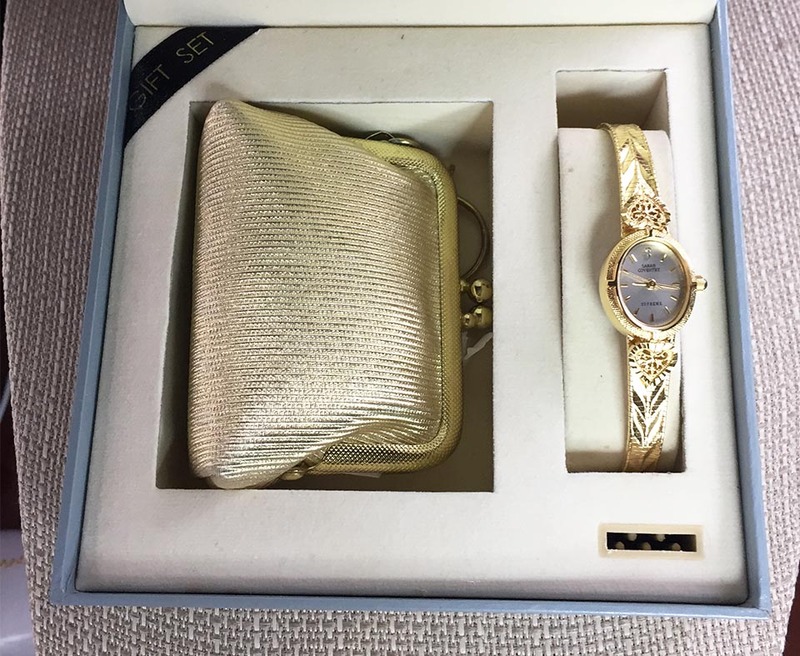 BOXED SET FEATURING A SMALL FORMAL GOLD PURSE WITH A KEY RING AND A GORGEOUS GOLD PLATED WATCH. NEVER USED. PURSE IS ABOUT 3 1/4" WIDE, 3" TALL WITH A CHAIN AND KEY RING ATTACHED. WATCH FACE IS 7/8" LONG, 3/4" WIDE. ADJUSTABLE. WATCH IS NOT WORKING...I AM NOT KNOWLEDGEABLE ABOUT WATCHES - IT COULD JUST NEED A BATTERY, BUT I'M NOT CERTAIN. BOX HAS SOME MARKS INSIDE, AS SEEN IN THE PHOTO. OUTSIDE OF THE BOX IS IN VERY GOOD CONDITION. 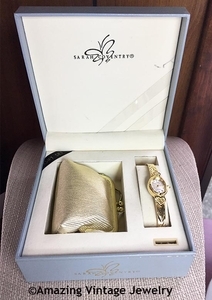 THIS IS FROM THE "NEW" SARAH COVENTRY BRANDED LINES THAT WERE PRODUCED AFTER THE ORIGINAL COMPANY CLOSED IN 1984.